Yesterday night PZ Myers, who I’m sure you all know blogs over at Pharyngula, was nice enough to give a lecture at Purdue University. I found out through an ecology listserv that he would be speaking at an evo-devo meeting at Indiana University in Bloomington this weekend, and he was willing to fly in a day early to stop by West Lafayette first. We were all incredibly excited, and the atheists at IU were incredibly jealous. Part of my duty at the President of the Society of Non-Theists was to safely retrieve PZ from the Indianapolis airport. Usually this would be a simple task – I’ve driven there a couple of times before and it’s about an hour and twenty away. The caveat was that PZ’s flight was supposed to arrive at 4pm, his talk started at 6pm, and flights are pretty much always late. It seems the Flying Spaghetti Monster was not watching over us, because I soon got a phone call from PZ saying his flight was running a half hour late. No problem, plenty of time, I thought. I got to the airport and read American Gods in the parking lot for a while to waste time. But pretty soon it was getting later and later, and we both started to freak out on twitter. I unfortunately didn’t have internet access, so I had no clue what was going on (though it was apparently fairly amusing to our mutual followers). I thought his talk was great, and so did everyone else (though I think some of the biology-heavy bits went over most people’s heads). He drew a big crowd – I wasn’t able to get an exact head count because there were so many people, but I’d estimate a little over 150 individuals were there. Just to give you an idea, here are a couple shots of the majority of the crowd (still leaving out about 30 or 40 people): Surprisingly, there weren’t many creationists there, or they were just keeping quiet. Only one question seemed to have a creationist bent, and no one looked especially furious. We then relocated to Boiler Market, a local restaurant with great food and cheap pitchers of beer, a winning combination. 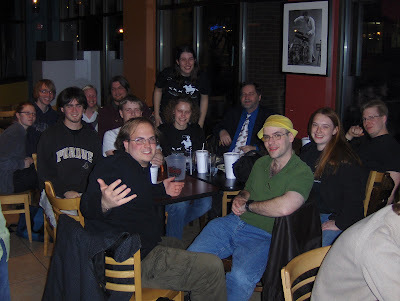 About 35-40 people showed up, and we had a great time talking with our fellow non-theists. This event definitely brought some new faces out of the woodwork – hopefully they’ll stay, and we’ll see them at future meetings! The best part for me was definitely driving PZ from and to the airport. I was lucky to have him to myself for nearly three hours, and it was great fun talking to him. We talked about biology, grad school, blogging, silly religious topics, the book he’s writing, and all sorts of random things. I had a blast, and I hope he did too! utorrent pro apk on I have my first scientific publication!